Can You Make Enough Money From Trading To Live A Comfortable Life? Most traders, not just in India but the whole world wonder if they can make enough money from trading to live a comfortable life. Yes the real question is if they can leave their day jobs and make similar amount trading the stock markets to feed their families. Well frankly I really don’t get this. Why everyone want to leave their jobs? Lets keep it for another day. I get many phone calls and mails asking something similar on the above lines. However recently I got this email from one of my subscribers Mr. Chandirasekaran which is quite interesting and I would like to share his question too. I have taken his permission. My answer follows the question. Fantastic article on how to manage our finances! I also agree with your views on Gold and property. Gold is not very lucrative over longer periods compared to equity. Similarly property is illiquid and not suited to middle class people like us as you rightly mentioned. By the way I wanted to ask you something. Its inspiring to know that despite 7 lakhs loss, you have learnt some hard lessons and finally came out of it and now able to generate sustainable income. Now I just wanted to know whether you are able to make money on an annual basis at least 70% of your last salary from options/equities etc. consistently? I mean whether you are able to meet all of your family monthly expenses and also able to lead a comfortable life? Most traders who take my options trading course ask me what I do with the profits earned with my trades. Well I believe in power of compounding. Frankly right now I do not need the money that I make from trading or the stock markets. So I would rather make sure I am compounding it. If I take it out and do not use it, and assuming I keep it in my bank account – it will grow at only 3.5% per year. Compare this to almost 3% per month. So where should I keep my profits? Of course I should reinvest it. If I keep re-investing in my trading account it will grow much faster than if I put it in my bank account or even an FD. You got your answer. I strictly follow the 25-25-25-25 rule. 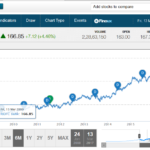 (25% of my savings goes into Government backed securities like FD, PPF etc, 25% goes into 4/5 star rated mutual funds, 25% goes into direct equity buying of companies with strong management and the rest 25% comes into my trading account. However since my limit of investing in the trading account is reached I do not add any more money into it – but do not withdraw the profits as well – so indirectly I am investing into it. For more detailed info read here.) Even if I want my wife will not allow me to invest more in my trading account. She cannot forget the bad times, and even today the pain is in me. In 2011 I really had a tough time to convince her to put some money out of our savings again into my trading account. It came out to be a good decision. However it does not mean I am not investing more into it. The profits generated are also earned money right? So investing 100% of the profits back into my trading account is also the same as bringing new money into the trading account. Essentially I do not feel the necessity to add any extra money to my trading account. Another reason is my limit of bringing new money into my trading account has been reached, so that law does not allow me to bring any more money. Yes temptation is there but I will not fall for it. However by not withdrawing money I am increasing my trading kitty. Hope its clear, bringing more money into the trading account every month or investing the profits back into it is the same. To answer your question – my account is still not that big that I can withdraw money from it every month and live a comfortable life. But if I keep going at this rate – eventually in 4-5 years I will be able to leave my part-time consulting job. But frankly I love my job, so I am not sure if I will leave it soon. I understand why you asked this. Most people who call me ask the same question. Can they make enough from trading to live a comfortable life? Well it depends on your needs, the kind of profits you can generate from trading and cash in your trading account. For example Family A may need Rs. 50,000 per month to live comfortably. The head of the family is smart and makes 10% profit per month, but his trading account has only Rs. 1 Lakh. He cannot leave his job at least now. Family B may need 1 lakh per month. They generate 5% profits per month and their trading account is 20 Lakhs. Yes target met. Their bread earner can leave his/her job. You get the point. Your family needs, the profit percentage and cash in trading account – all will have to be taken into account when someone decides to leave his job and fully depend on profits generated from trading. Frankly you will find few people doing that. Even hedge fund managers have a job. Mutual fund managers have a job. You need a lot of money to make a lot of money. But one can get there, it only needs determination, hard-work, patience and a step by step approach. It will take time. Since Mr. Chandirasekaran asked me this question, I will try to explain it as a normal retail trader. But please assume that it could be you. In a worst case scenario at 2-3% a month a 10 lakh account may be making anywhere between 20,000 to 30,000 a month. For me that is not enough. I need to make at least one lakh a month to live comfortably. For that around 40 Lakhs is needed. When you have 40 Lakhs to trade it has to do with traders mindset as well. 1. 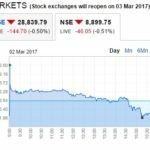 If I have only 40 Lakhs as savings – it is foolish and suicidal to keep 100% of it in a trading account. One silly mistake can take it all. What if by mistake you press the “sold” button and thought that you have actually “bought” and did not see the order/trade reports or the Contract Notes. Yes it is a rare blunder – but what if this happens? We are humans and we can do mistakes right? After a few days you check to see that option has doubled and eventually when you wanted to book profits you find that you have lost a lot of money because you did a silly mistake. Remember you will not get back this money. a) If you keep 40 lakhs in a good debt fund or FD it will give you a return of around Rs. 30,000 per month without any work or stress on your part. Compare this to all the hard work and stress required for trading. b) If you have 40 lakhs more in FDs or whatever you tend to be complacent. You try to get aggressive. Why? Because you have a lot of money (around 80 lakhs) – now you want to make even more “lots of money”. Greed leads a trader take huge risks and lose a lot of money. One trader a few days back called me to say its ok for him to lose Rs. 30,000/- per month but not more. WHAT? He is willing to lose that much per month. Why? Because he generates 1 lakh in interest per month. Frankly I think he does not need any more money – he wants to trade to pass his time or try aggressive trading to make loads of money. Probably just to satisfy his ego. People trading to pass time/kill boredom/have fun and/or aggressively trading to make a killing – all are doing a big mistake. They will most certainly lose money. 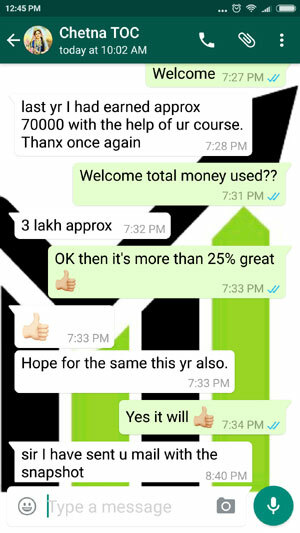 One trader with more than 1 crore in his account took my course. I asked him why is he taking my course? He already has a lot of money, so what is the need to trade with so much money? (Well there is nothing wrong to trade with a one crore account, but I just wanted to ask. How many times do you get an opportunity to talk to a retail trader with a one crore account? As a trader I wanted to know his psychology.) He said that he loves to double his money. Well here is the story: He started with a few lakhs, took the account to one crore and on that day was sitting on a unrealized loss of 90 lakhs. Like I said these people take unlimited risks, because they have unlimited money and they do not care. It comes back to the same question – can you generate enough to make a living out of trading? Step 1) Invest money in stock trading education. There are books, websites and people offering education. Get education from reliable sources. Learn some trading strategies. Step 2) Start paper trading on the strategies you are comfortable with. When you are paper trading be serious. Treat this as real business and real money even if no money is involved. When paper trading I recommend trading with at least 10 lots or more. Remember no money is involved so you should learn as much as possible. With 10 lots you will make or lose a lot of money – this will help you to understand what happens when you will trade with a lot of money. Write the trades in a notepad or excel sheet. You should also approximately deduct the brokerages even if this is paper trading. This will help you to calculate real ROI. Paper trade for 3 months at least. If you are making losses. Go back to Step 1. It means your knowledge is lacking or your strategies needs improvement. Come back to Step 2. Again practice for 3 months. If profitable even 1 percent, go to step 3. Step 3) You are now confident and ready to trade. Take some money out of your savings (at least one lakh) and put it in a trading account. Make sure your trading account is with a discount broker charging Rs. 20/- or less per trade not per lot. This will save you a lot of money on brokerage. Step 4) Its time for real trade. Trade small in one or two lots only, even if you feel great and want to go all out. If you are successful for 3 months, increase the trades with 1 lot. 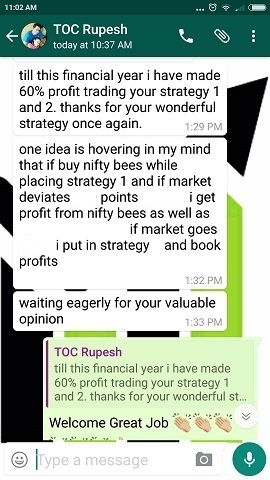 After one year consider yourself successful trader if you have done at least 50 trades and made even 1 rupee profit. Yes its good enough to break even in your first year of trading. Now if you feel money is short, this is the time to add money to your trading account. You are making profits – there is nothing wrong in adding money to a small account. Add small and a fixed amount every month. However you should keep an overall limit. Like this it will take some time but eventually you will reach a point where you will be comfortable trading and making enough to support your family. Step 5) Leave your job when you are 100% sure you can make a living out of trading. Step 6) Do not get aggressive and take huge risks when your account has grown big. You may not believe but this is the most difficult step to follow. As I have said people with huge accounts rarely make money because losing a few thousands every month mean nothing to them as they want a big killing trade. For this one trade they keep taking big risks and keep failing until they realize their account is fully blown up. At this time it is too late to recover. There was one option trading firm in USA that lost years of profits in just one bad trade. I hope if you are already there or will reach there one day, will remember this article and not commit such a blunder. In the whole process keep your spouse in the loop. Profits and losses should be shared. Why? This will stop you from taking unnecessary risks. In the back of your mind if you know that you are answerable to someone, you will never take big risks. Sharing your profitable trades will make you happier and sharing your loses will reduce the pain. It looks trivial but it works. As you can see growing slowly is the mantra. Compound your money to such an extend that you feel comfortable leaving your job. If you take it step by step – that day will come sooner or later. But if you want to jump and reach there fast – you will fall and fall badly. All the best to all those who want to accomplish this, and of course to other traders as well. Absolutely amazing article Dilip. Precise guidelines that needs to be followed by every trader. Thanks Sanjoy. Unfortunately traders do not follow these simple guidelines. Almost everyone thinks that stock markets are like a lottery and they can make money really fast. When that does not happen some blame it on their luck and some start thinking that it is impossible to make money from trading. Both of these are wrong. When you can plan your career for the next 10-15 years why can’t you plan your trading for the next 10-15 years? Why people want their trading to be successful from day one? Someone at the age of 30 can make really big money by the time he/she is 40. You still have 20 years to retire right? Even at 40 you can make it big by 50. If you take small steps one by one, you will reach there. Dilip thanks for a wonderful site.. it reinforced my faith in options..
After spending nearly two good hours on your site and reading this article I must say that I cant leave my job for trading and leaving, cz I dont have one…. Finally I like you said “In the whole process keep your spouse in the loop” which made me to remember an funny incident..
Babu 🙂 Absolutely right. And yes I quite agree that wife is “a default risk management free for life” ONLY if you inform her about your profit/loss in any business that includes options trading. Basically it works like this. Most females in our Indian culture are brought up in a conservative environment. The result is that when they grow up, mostly they either do not like to take big risks or take only a limited risk. Now if you tell her you are making money trading options she will stop you from putting 100% of what you own into trading (we men would love to do it even if we are successful 3 months trading because the feeling we are the best sinks in). This happens because usually when we men win we are in a hurry. We start thinking lets make as much as possible and as soon as possible. We forget that even Warren Buffett had to wait for years before his stocks multiplied many folds in profits. 5. And last but not the least – they want to keep some money very safe for the kids. In the other situation where most retail option traders fall who lose money trading. If they inform their wife about their losses, I can bet there is going to be a huge fight in the house. She will most certainly ask her husband to stop trading and concentrate on his Job. I think this is one big reason why most Indian retail traders hide their trading losses from their wives. They either want to avoid a fight or just want to have some fun trading even if they are losing money. Its ok up to a certain extent. But what concerns me is when these losses runs into lakhs – too big a money that could have changed the fortune of the whole family. Their kids, spouse, parents everyone. You have no right to destroy your hard earned money (or even gifted wealth) just for fun or ego. Stock markets are your best friends to generate wealth over a long time. Even 10 years is good enough. But most people just want to make 1 lakh every month from 1 lakh in their trading account. These are the people who will most certainly lose money because they take huge risk and mostly fail. When their account reaches 50 thousand, they again bring 50 thousand to try their luck. Eventually after a few years they realize their losses have run into many lakhs which they will never be able to recover. Then they stop trading. jokes apart, what is an ideal capital that you feel to trade options like a business or for a living? Interesting question but it depends on “how much” is comfortable for you? For example Mr. X may be comfortable with Rs. 30,000 profits per month and Mr. Y with Rs. 50,000. This is a very personal matter. And it also depends on the kind of profits you are generating from the stock markets. 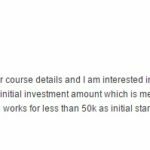 If you have one lakh and making 3%, then your profit is only 3000. But if you have 10 lakhs then your end up making Rs. 30,000 pm. But if you have 30 lakhs then at 3% you making 90,000 a month. But what about losers? Say you lose at 5% per month. Than even unlimited amount of money will be of no help. So ideal capital cannot be defined unless one knows how much average profit he can make per month from the markets and how much he/she is comfortable with or their family needs are. Yes you need Rs. 30,000 minimum in India to afford a middle class lifestyle and this is also true that not many have 10 lakhs to risk in the markets. However Babu isn’t this true for every business? To start a normal business in today’s India – you need to invest at least 10 lakhs or more. Real estate, construction, business plan, cost of products/production, shipping costs, employees pay etc. Even after that a business can flop. So risk is there in any business. Stock markets are no different. But here if you have money and good skills atleast you don’t need any infrastructure, employees or any customer service or costs involved other than brokerage. The beauty is that you can get started with little money which I am sure everyone can afford. Yes you have to make profits – and that is the bottom line in every business. If you can re-invest the profits back into trading it won’t take you a lot of time to get into a comfortable level. Inflation is a good point. But its growing at only 7-8% in a year. The only way to beat inflation is to make more than inflation. Considering you are making 40% a year – you beat inflation by a huge margin. So to answer your question – if you can compound the profits and withdraw only a portion of profits for the day to day needs – you can hit the target of making good monthly income in a few years. Remember Life is a struggle. Nothing comes easy. You will have to fight it out to come out winner. Take my case. I lost 7 lakhs. I had two choices – forget stock markets forever or try again with knowledge. Did knowledge come for free? No. I had to study. Struggle. Try small trades and then take bigger steps. Money is unlimited in this world, but it only comes to people with knowledge in every field – Stock market is no different. 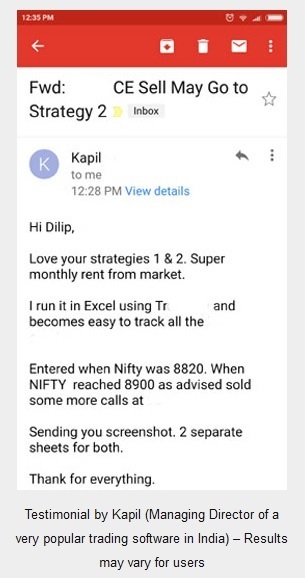 Dilip… most of your option trading experiments, experience and findings are almost smiler to mine:-) I second you on your comparison between trading and small business.. Some one rightly said “the real asset in life is, an ability to generate constant & sufficient income for life time” it may through job, investment or self employment!! Each and every person should posses one or the other set of skill, to make a living irrespective of his earning as CEO or as a common wall painter or a cobbler … trader too, no exception…. and you are doing a novel and humble duty of sharing your hard earned “skill” empowering all readers of your site which will add up faith in traders who want to make living out of it!!! I will be happy to take part in this selfless effort of yours in any best possible manner! Yes I had faith, you are right and therefore I am still here trading. For first year I offered no service in the site. There was not a single ad on my site as well. So there was no income from this site. I just wanted to help every trader for free. I have a family, two very young kids, parents – and most importantly a wife who keeps me grounded. She started asking questions like helping is fine – but this website is taking too much of our time. Time is limited, not free and we are already short on time managing kids and house. She told me if you cannot make this website productive in whatever terms then itâ€™s better to stop writing on this site. And I think she was right. It was taking too much of my time. So I had to start a service. Though my charges for educating strategies is very nominal compare to the value it gives. And this also keeps me motivated to write for the site. Compare my fees to what most strategy developers charge. My fee is nowhere near theirs yet I offer support for a lifetime. This shows how much confidence I have in my strategies. I also provide suggestions for my clients own strategies for free. No one does that in India. 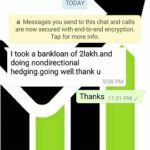 I offer option education to help traders make money for life. And I am very satisfied with my service. What makes me happier is talking to them and knowing their problems. Some share their family problems as well. I feel so happy giving them financial advice even if they decided not to take my service. I denied an old person who wanted to take my service because he wanted to trade with the money he got after retirement. Options trading should be done to make money for retirement. I donâ€™t think one should use retirement money to trade options even if they are very good at it. This is the time to relax and enjoy life. Thanks for your help Babu. The best way to help traders who visit my site is to ask questions like you are asking on the strategies or add value to it in whatever way by writing in the comments section. You look like an experienced trader. Please let us know more about you. well I am designated as Sr. Strategist & Analyst – Options, at a small sized domestic research firm & having 12 years of real market experience. 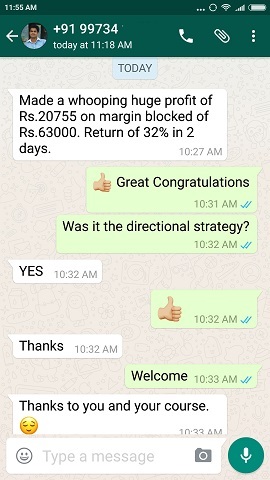 Double PGDM by Education, while studying options learned some statistic and presently & personally working on probabilistic methods with regards to option trading. Strange thing about my option structures are I never use Greeks and VIX though I understand them like a bright student. What I use is, worst come scenario analysis, its nothing but the structural out come based on expiry day levels! 3. Drafting a Strategy is nothing but creating a judicious betting system! 1. Yes hedge does not mean you will always be in profits – but it does help to restrict losses and profits too. 3. Totally disagree. I NEVER bet. Never gamble. (I used too though and lost quite a bit.) If the logic is clear and risk management is in place I am not betting.